It’s Saturday morning, very early. It’s quiet, enough to hear a pin drop in your boat. The lake is like a mirror, and you marvel at the silent beauty as you float along. But wait, there’s something missing in this scene, something quite important. Where are the fish? If your instinct can’t find them, don’t panic–technology can. And you don’t have to spend thousands of dollars to get a good a fishfinder, there are great units selling for less than $250. The most popular models in this price range are: Garmin echo 301dv, Lowrance Elite-4 HDI and Humminbird 346c HD DI. Let’s find out which one of the three is the best unit. Garmin echoMap 43dv is a new Garmin model for 2015. The major enhancement is the screen size – it’s 4.3 inch diagonal, larger that the 3.5 inch display in its predecessor – 301dv. The 43dv provides a photographic view of what’s under the boat using the DownVu technology. The unit also has the traditional sounder capabilities found in the old echo series. It comes with a dual beam 77/200 kHz transducer, and the transmit power is 500W RMS. The sonar reaches as deep as 2300 feet. Additionally, for ease with mounting the device, the Garmin echoMap 43dv has a quick-release tilt/swivel mount, a transom mount, and low-profile trolling motor mounting kits. The echoMap 43dv provides virtually photographic structure detail. The imagery is uninterrupted with the Smooth Scaling graphics when switching between depth range scales, so you don’t have to worry about missing anything. We have found the Garmin echoMap 43dv powerful and simple to use with clear color images that make it easy to see what’s under your boat. Fumbling with a complicated fish finder is the last thing you want to do as the fish swim away from your boat and you lose your chance at hooking one. Elite-4 CHRIP has a 4.3 inch, color screen and it utilizes it very effectively. The LED backlit, high resolution color display is vibrant and easy to read. The Elite-4 CHRIP has the ability to produce a multi-window display and allows users to customize their layouts. The unit comes with the hybrid broadband/downscan transducer, capable of reaching the depth of 750 feet in the traditional sonar mode. The Elite-4x is easy to use thanks to the Advanced Signal Processing feature that automatically adjusts sonar settings to optimal configuration. Just like the bigger CHIRP models, the Elite-4 supports DownScan Overlay technology, which overlays photo-like downscan images onto broadband sounder output. The combination of these 2 displays makes for a more accurate and complete underwater image, allowing you to pinpoint individual fish. It also comes equipped with TrackBack feature that lets users to backtrack for objects on a graphical sonar timeline without having to turn the boat completely around. If you find something interesting, you can use an onscreen cursor to check its depth and then make your way towards it. Garmin echoMap 43dv, Lowrance Elite 4 CHIRP and Raymarine Dragonfly 4PRO are all very good, compact fishfinders. 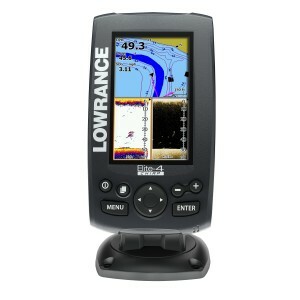 The unit that is by far the best of the three models is Lowrance Elite 4 CHIRP. It has the larger screen offering 70 percent more pixels and 36 percent more display area than the Raymarine. Elite 4 CHIRP also provides many great features such as Downscan Overlay that are not found on the other 2 models. Lowrance Elite 4 CHRIP is our pick for the best fishfinder under $300.